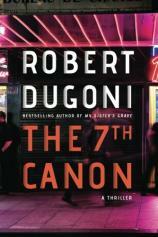 In his latest book, THE 7th CANON, bestselling author Robert Dugoni puts the breaks on his Tracy Crosswhite series for a new look at law enforcement, thrills and, of course, complicated cases with multiple victims and perpetrators. Despite numerous red herrings and various twisted ties, it is up to Dugoni’s new hero, Peter Donley, to uphold the eponymous 7th Canon: "A lawyer should represent a client zealously within the bounds of law." While Dugoni’s Tracy Crosswhite series is set in our own contemporary world, give or take a few years, THE 7th CANON takes readers back to San Francisco’s seamy Tenderloin district in 1978. While the neighborhood is ripe for crimes such as drug dealing, prostitution and violence, the area is just starting to see an upturn, particularly with the opening of a new shelter for boys. Just as Christmas begins its rapid approach, Father Thomas Martin, “The Priest of Polk Street,” is facing another evening of caring for young, troubled and trouble-making boys who do not want the help --- as badly as they need it. Ever the optimist, he waits an extra 10 minutes past closing each night in hopes that more boys will filter in looking for an escape from the streets. On the night of December 21st, however, Father Martin is horrified to discover the tortured and murdered body of one of his charges. Before the night is over, he is found covered in the boy’s blood with a murder weapon and incriminating photos nearby. "As always, Dugoni does not rely just on cheap tricks to keep the pages turning, choosing instead to balance murders and lies with perfect, slowburn pacing and expertly developed character arcs." Enter Peter Donley, a 28-year-old lawyer who has spent the past three years cutting his teeth working nearly impossible cases at his uncle’s law firm. His uncle Lou has a reputation for choosing difficult cases and winning them --- often without charging the exorbitant rates of his less successful peers. While Donley would not be half the lawyer he is without his uncle’s guidance, he has a young son at home and has begun receiving offers from larger, more profitable firms. With the Christmas season underway, Donley has some big decisions to make. When Donley’s uncle collapses in court, the case of Father Martin falls into Donley’s lap, and he must take control of a situation far larger and more complicated than anything he has handled before. As he begins to investigate, he finds several anomalies in Father Martin’s case --- none of which paint the police department in a positive light. All the while, the tones of violence and reckless behavior threaten to dredge up Donley’s own past, which was shrouded in abuse and rage. Meanwhile, district attorney Gil Ramsey and his chief prosecutor, Linda St. Clair, are nearly brimming with excitement at the thought of persecuting Father Martin. Despite the inconsistencies in his case, it will be a big deal for them as a team, and one that may help Ramsey further his career in ways that his overbearing father never could. As more and more disturbing details come to light, however, it seems that Ramsey may know more about the case than he is letting on --- and that his terrifying father may know even more than him. Then there’s Detective Dixon Connor, an archetypal “bad cop” with a chip on his sleeve, a point to prove and the raw, seething rage to accomplish anything he wants. Although Connor is not physically present for most of the narrative, he makes quite the impression. Barring deranged serial killers and controlling fathers, Connor may be Dugoni’s most terrifying villain yet. As all of these characters come together to expose the real murderer, each of their motives and dark pasts come to light in highly suspenseful ways. As always, Dugoni does not rely just on cheap tricks to keep the pages turning, choosing instead to balance murders and lies with perfect, slowburn pacing and expertly developed character arcs. With the narrative constantly switching gears and exposing new sides of each character’s story, Dugoni is careful to keep readers fully engaged and reading along without revealing major plot twists too soon or without proper fanfare. Readers of the Tracy Crosswhite series will appreciate Dugoni’s trademark talent for weaving together multiple storylines, while newcomers will delight in his male protagonist, a man who, like Tracy, has his own secrets with painful ties to the case at hand. As a huge fan of Dugoni’s, I admit that I initially found the switch from epic police chases and investigations to the legal side of the law a bit difficult --- the expanded cast of characters was more than I was anticipating --- but trust me when I say that it is worth the read. Dugoni is a writer who I believe could bring excitement to even the most mundane of storylines, and THE 7th CANON is anything but dull. With a new hero on our side and lots of San Francisco’s seedy underbelly left to explore, I hope that Peter Donley will become the next Tracy Crosswhite. Who knows? Maybe the two will work a case together when their timelines converge.